Compact chestnut shaped mass covered with thin primary fusion crust. 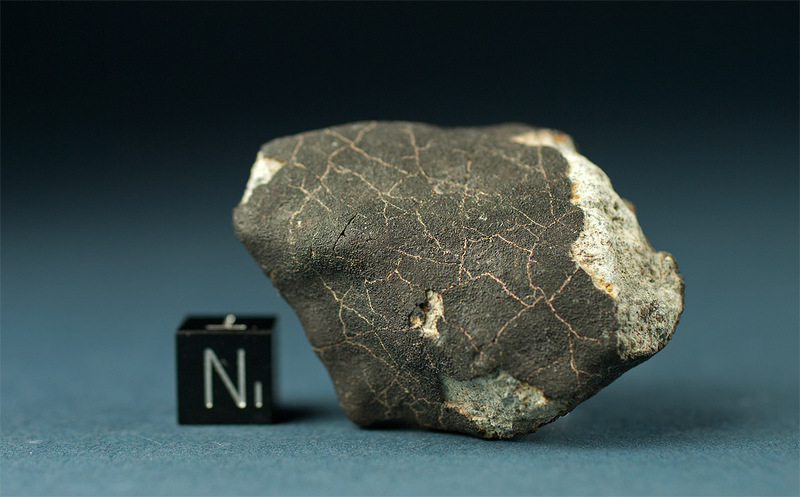 The meteorite shows a delicate webbing of caliche-filled contraction cracks as effect of weathering. The matrix is of bright ashy color with fine uniform grain texture and shows signs of a very fine brecciation. Given the relatively rare type of the meteorite and the fall of the Kilabo LL6 meteorite only five months later in Nigeria, several researchers speculated that both meteorite falls might have been related and perhaps originated from a common meteorite stream (Cole et al. : Kilabo and Bensour: A comparative study of two recent LL6 falls, 2003). However the cosmic ray exposure ages of Bensour and Kilabo were found different (Ustinova et al. 2008). It has been suggested that a possible candidate for the parent body of all LL’s might be asteroid 3628 Boznemcova (1979 WD), though no spectral data yet exists for this object.